The selection of the names reflects the Officina’s return to countries where it was known in the 18th century. Ottone takes us to northern Europe, Germany and Russia, while Porcellana lead us to the Far East, birthplace of this elegant material and whose tradition the Medicis found extraordinarily fascinating. Ottone is enveloping and decisive, Porcellana is delicate and romantic. Ottone has notes of rose, bergamot, petitgrain, oregano, clove, cinnamon, pepper, sandalwood, cedar and incense. Porcellana features jasmine, white flowers, star anise, cardamom, galbanum, iris and cedar. That Porcellana is calling my name… quietly though, since several SMNs now have given me pounding headaches. Hope this is one that won’t! Did you say Florence? I’ll join you!!! Duh! Thanks so much. Last I looked they were out of Eva altogether, and don’t remember them having this size. I guess the trip to Florence is out? Yeah, LAFCO is where I always buy my SMN from. Shame about that trip to Florence, though. Well, I’m sure we can come up with other reasons to go! Yeah, Eva was definitely n/a everywhere for awhile. It’s back in stock at Aedes too… I’m very close to ordering a sample of it with a batch of other samples. Me too, both RE: Porcellana and RE: the pounding headaches– Mughetto in particular. Yet I like it anyway. Strange. I have already tried Ottone and it’s beautiful. Smokey spicy creation that sits on calm woods is brilliant. Well the price here is not very charming though, around USD250 (NTD 7500) here. The Ottone sounds lovely, however if it’s truly $250 — why? — I think I’ll probably have to pass. I really wish they’d return to their old paper lables, as well. These bottles are just for these 2, I think. Actually, the two special creations have this worldwide promotion goes with purchasing. SMN requires everyone who bought any of the two to fill out a detailed form, for their database I guess. And get this, SMN needs your name, so that your name goes on to their monumental wall in Florence. Pretty fascinating huh? A purchase with another desire flying to Florence, Italy. Interesting! And the fragrances sound lovely. Both do sound lovely. Field trip to Italy? I’m in…. Neither of these sound good to me (not that that ever means anything), but I love the bottles! I was trying to figure out why the name “Porcellana” made me laugh, and I think I have it: Wasn’t it a fade cream for women? For age spots? Or am I just making this up? Omigosh Ms Kitty – you’re right! That’s hilarious! I think that was “Porcelana;” but it’s still close enough to be really funny. I think that “porcellana” means “porcelain” and that thut must have been what “Porcelana” was trying to evoke. Both of these sound really nice to me, but, at those prices, I think I’ll pass. No, I remember that too. Kinda jumping the gun on a 400 yr anniversary release , arent they? If the big 1612 stamped on the front of the bottle is any indicator, they are still 2 years shy. Ottone is going to take me to Germany??? I need to get it!!!! It only sounds vaguely interesting to me though. Did I miss something? It’s available in Germany? Please let me know where. I’ve become a big fan of SMN so I’d love to sample these at some point, if that ever becomes possible. It may not be obvious, but since Ottone means ‘brass’, it seems like the bottle is either made of brass or a similar looking opaque metal. Nice. I like the white porcelain bottle though.. always a sucker for opaque ceramic bottles. Maybe it’s the materials that make it so expensive if it’s going to be at a high price point. I recently smelled SMN for the first time. 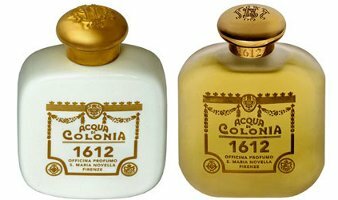 I was confounded by the labels, as almost all of their colognes have the exact same thing printed on them (except the Russe and Melograno). So I assumed that they were all just the “cologne”. Looking at their website, they have 10 or more all with the same printing. I didn’t check the bottom, so I assume there is a sticker somewhere telling you which is which. Yes, there is a sticker on the back. I was confused that way, too. the bottles are gorgeous, they both sound yummy…i am so glad the range is not available here…so $ saved!! !What is eva?